This article is about the people. For their denominations, see Saint Thomas Christian denominations. The Saint Thomas Christians, also called Syrian Christians of India, Nasrani or Malankara Nasrani or Nasrani Mappila, are an ethnoreligious community of Malayali Syriac Christians from Kerala, India, who trace their origins to the evangelistic activity of Thomas the Apostle in the 1st century. The terms Syrian or Syriac relate not to their ethnicity but to their historical, religious, and liturgical connection to Syriac Christianity. The term Nasrani was derived from Semitic languages like Syriac (نصرانی) and Arabic (نصارى) and refers to Christians in general. Historically, this community was organised as the Province of India of the Church of the East in the 8th century, served by Nestorian bishops and a local dynastic Archdeacon. The Church of the East eventually declined in the 16th century due to outside influences like the Islamic invasion and the influence of the Catholic Church. The Schism of 1552 split the Church of the East into two factions, the independent Assyrian Church of the East and the Chaldean Catholic Church which is in full communion with Rome. Both the factions follow the East Syriac Liturgy of the historic Church of the East. In the 16th century the overtures of the Portuguese padroado to bring the Saint Thomas Christians into the Catholic Church led to the first of several rifts in the community. The majority of Nasranis joined in formal communion with Rome, to form the Syro-Malabar Church which is distinct and separate from the Western Latin Church but is one of the Eastern Catholic Churches. The remaining group entered into a new communion with the Syriac Orthodox Church, to form an Oriental Orthodox (Malankara) Church. The Syro-Malabar Catholic Church follows the East Syriac Liturgy of the historic Church of the East, traditionally attributed to Saints Addai and Mari which dates back to 3rd-century Edessa. The Malankara Church follows the West Syriac Liturgy of the Syriac Orthodox Church, traditionally attributed to Saint James, and is an ancient rite of the Early Christian Church of Jerusalem. Since that time further splits have occurred, and the Saint Thomas Christians are now divided into several different Eastern Catholic, Oriental Orthodox, Protestant, and independent bodies, each with their own liturgies and traditions. The Eastern Catholic faction is in full communion with the Holy See in Rome. This includes the Syro-Malabar Catholic Church and the Syro-Malankara Catholic Church. The Syro-Malankara Church were a minority faction within the Oriental Orthodox faction that joined in communion with Rome in 1930 under Bishop Mar Ivanios. The Oriental Orthodox faction includes the Malankara Orthodox Church and the Malankara Jacobite Syrian Orthodox Church. The Malankara Orthodox Church is headed by the Catholicos of the East and Malankara Metropolitan in Kottayam, India. Whereas the Malankara Jacobite Syrian Orthodox Church is an integral part of the Syriac Orthodox Church and is headed by the Syriac Orthodox Patriarch of Antioch in Damascus, Syria. Independents include the Malankara Marthoma Syrian Church and the Chaldean Syrian Church of India. The Marthoma Syrian Church were a part of the Malankara Church that went through a reformation movement under Abraham Malpan due to influence of British Anglican missionaries in the 1800s. The Mar Thoma Church follows a reformed variant of the liturgical West Syriac Rite. The Chaldean Syrian Church is an archbishopric of the Assyrian Church of the East in Iraq. They were a minority faction within the Syro-Malabar Catholic Church, who split off and joined with the Church of the East Bishop during the 1700s. Saint Thomas Christians represent a multi-ethnic group. Their culture is largely derived from East Syriac, Hindu, Jewish,  and West Syriac influences, blended with local customs and later elements derived from indigenous Indian and European colonial contacts. Their language is Malayalam, the language of Kerala, and Syriac is used for liturgical purposes. The Saint Thomas Christians are classified as a Forward caste by the Government of India under its system of positive discrimination. The Saint Thomas Christians have also been nicknamed such due to their reverence for Saint Thomas the Apostle, who is said to have brought Christianity to India. The name dates back to the period of Portuguese colonisation. They are also known, especially locally, as Nasrani or Nasrani Mappila. The former means Christian; it appears to have been derived from the Hebrew word Netzer or the Aramaic Nasraya from Isaiah 11:1. Mappila is an honorific applied to members of non-Indian faiths and descendants of immigrants from the middle east who had intermarried with the local population, including Muslims (Jonaka Mappila) and Jews (Yuda Mappila). Some Syrian Christians of Travancore continue to attach this honorific title to their names. The Government of India designates members of the community as Syrian Christians, a term originating with the Dutch colonial authority that distinguishes the Saint Thomas Christians, who used Syriac (within East Syriac Rite or West Syriac Rite) as their liturgical language, from newly evangelised Christians who followed the Roman Rite. The terms Syrian or Syriac relate not to their ethnicity but to their historical, religious and liturgical connection to the Church of the East, or East Syriac Church. According to tradition, Thomas the Apostle came to Muziris on the Kerala coast in AD 52, which is in present-day Pattanam, Kerala. The Cochin Jews are known to have existed in Kerala in the 1st century AD, and it was possible for an Aramaic-speaking Jew, such as St. Thomas from Galilee, to make a trip to Kerala then. The earliest known source connecting the Apostle to India is the Acts of Thomas, likely written in the early 3rd century, perhaps in Edessa. A number of 3rd and 4th century Roman writers also mention Thomas' trip to India, including Ambrose of Milan, Gregory of Nazianzus, Jerome, and Ephrem the Syrian, while Eusebius of Caesarea records that St. Clement of Alexandria's teacher Pantaenus from Alexandria visited a Christian community in India using the Gospel of Matthew in Hebrew language in the 2nd century. The tradition of origin of the Christians in Kerala is found in a version of the Songs of Thomas or Thomma Parvam, written in 1601 and believed to be a summary of a larger and older work. Thomas is described as arriving in or around Maliankara and founding Seven Churches, or Ezharapallikal: Kodungallur, Kollam, Niranam, Nilackal (Chayal), Gokkamangalam, Kottakkavu (Paravur), Paloor (Chattukulangara) and Thiruvithamcode Arappally (a "half church"). The Thomma Parvam also narrates the conversion of a few Jews, along with many natives, and the local King at Kodungallur by St Thomas. The Thomma Parvam further narrates St Thomas's mission in the rest of South India and his martyrdom at Mylapore in present-day Chennai, Tamil Nadu. According to legend, the community began with Thomas' conversion of Brahmin families, namely Pakalomattom, Sankarapuri, Kalli, Kaliyankal, Nedumpilly, Panakkamattom, Kunnappilly, Vazhappilly, Payyappilly, Maliakkal, Pattamukku and Thaiyil. Other families claim to have origins almost as far back as these and the religious historian Robert Eric Frykenberg notes that "Whatever dubious historicity may be attached to such local traditions, there can be little doubt as to their great antiquity or to their great appeal in popular imagination". While there is much doubt on the cultural background of early Christians, there is evidence that some members of the St Thomas Christian community observed Brahmin customs in the Middle Ages, such as the wearing of the sacred thread and having a kudumi. The medieval historian Pius Malekandathil believes these were customs adopted and privileges won during the beginning of the Brahmin dominance of medieval Kerala. He argues that the Syrian Christians in Kerala, integrated with Persian Christian migrant merchants, in the 9th century to become a powerful trading community and were granted the privileges by the local rulers to promote revenue generation and to undermine Buddhist and Jain traders who rivaled the Brahmins for religious and political hegemony in Kerala at the time. An organised Christian presence in India dates to the arrival of East Syriac settlers and missionaries from Persia, members of what would become the Church of the East, in around the 3rd century. Saint Thomas Christians trace the further growth of their community to the arrival of Christians from the Middle East led by Knāy Thoma (anglicized as Thomas of Cana) , which is said to have occurred either in the 4th or 8th century. The subgroup of the Saint Thomas Christians known as the Knanaya or Southists trace their lineage to Thomas of Cana, while the group known as the Northists claim descent from the early Christians evangelized by Thomas the Apostle. Tharisapalli Copper plate grant (9th century) – One of the reliable documentary evidences of the privileges and influence that Saint Thomas Christians enjoyed in early Malabar. The document contains signatures of the witnesses in Pahlavi, Kufic and Hebrew scripts. It is the oldest documentary evidence available to attest the presence of a Persian Christian community in South India. As the community grew and immigration by East Syriac Christians increased, the connection with the Church of the East, centred in the Persian capital of Seleucia-Ctesiphon, strengthened. From the early 4th century the Patriarch of the Church of the East provided India with clergy, holy texts, and ecclesiastical infrastructure, and around 650 Patriarch Ishoyahb III solidified the Church of the East's jurisdiction over the Saint Thomas Christian community. In the 8th century Patriarch Timothy I organised the community as the Ecclesiastical Province of India, one of the church's Provinces of the Exterior. After this point the Province of India was headed by a metropolitan bishop, dispatched from Persia, the "Metropolitan-Bishop of the Seat of Saint Thomas and the Whole Christian Church of India". His metropolitan see was probably in Cranganore, or (perhaps nominally) in Mylapore, where the shrine of Thomas was located. Under him were a varying number of bishops, as well as a native Archdeacon, who had authority over the clergy and who wielded a great amount of secular power. Some contact and transmission of knowledge of the Saint Thomas Christians managed to reach the Christian West, even after the rise of the Islamic empires. Byzantine traveller Cosmas Indicopleustes wrote of Syrian Christians he met in India and Sri Lanka in the 6th century. In 883 the English king Alfred the Great reportedly sent a mission and gifts to Saint Thomas' tomb in India. During the Crusades, distorted accounts of the Saint Thomas Christians and the Nestorian Church gave rise to the European legend of Prester John. The great distances involved and the geopolitical turmoil of the period caused India to be cut off from the church's heartland in Mesopotamia at several points. In the 11th century the province was suppressed by the church entirely, as it had become impossible to reach, but effective relations were restored by 1301. However, following the collapse of the Church of the East's hierarchy in most of Asia later in the 14th century, India was effectively cut off from the church, and formal contact was severed. By the late 15th century India had had no metropolitan for several generations, and the authority traditionally associated with him had been vested in the archdeacon. In 1491 the archdeacon sent envoys to the Patriarch of the Church of the East, as well as to the Coptic Pope of Alexandria and to the Syriac Orthodox Patriarch of Antioch, requesting a new bishop for India. The Patriarch of the Church of the East, Shemʿon IV Basidi responded by consecrating two bishops, Thoma and Yuhanon, and dispatching them to India. These bishops helped rebuild the ecclesiastical infrastructure and reestablish fraternal ties with the patriarchate, but the years of separation had greatly affected the structure of the Indian church. Though receiving utmost respect, the metropolitan was treated as a guest in his own diocese; the Archdeacon was firmly established as the real power in the Nasrani community. The Saint Thomas Christians first encountered the Portuguese in 1498, during the expedition of Vasco da Gama. At the time the community was in a tenuous position: though thriving in the spice trade and protected by their own militia, the local political sphere was volatile and the Saint Thomas Christians found themselves under pressure from the rajas of Calicut and Cochin and other small kingdoms in the area. The Saint Thomas Christians and the Portuguese newcomers quickly formed an alliance. The Portuguese had a keen interest in implanting themselves in the spice trade and in spreading their version of Christianity, which had been forged during several centuries of warfare in the Reconquista. Facilitating their goals was the Padroado Real, a series of treaties and decrees in which the Pope conferred upon the Portuguese government certain authority in ecclesiastical matters in the foreign territories they conquered. They set up in Goa, forming a colonial government and a Latin church hierarchy under the Archbishop of Goa, and quickly set to bringing the Saint Thomas Christians under his authority. The Portuguese subjection of the Saint Thomas Christians was relatively measured at first, but they became more aggressive after 1552, the year of the death of Metropolitan Mar Jacob and of a schism in the Church of the East, which resulted in there being two rival Patriarchs—one of whom entered communion with the Catholic Church. Both patriarchs sent bishops to India, but the Portuguese consistently managed to outmaneuver them, and effectively cut off the Saint Thomas Christians from their hierarchy in 1575, when the Padroado legislated that neither patriarch could send representatives to India without Portuguese approval. By 1599 the last Metropolitan, Abraham, had died, and the Archbishop of Goa, Aleixo de Menezes, had secured the submission of the young Archdeacon George, the highest remaining representative of the native church hierarchy. The Archbishop convened the Synod of Diamper, which implemented various liturgical and structural reforms in the Indian church. The Synod brought the parishes directly under the Archbishop's purview; anathematised certain "superstitious" social customs characteristic of their Hindu neighbors, including untouchability and a caste hierarchy; and purged the liturgy, the East Syriac Rite, of elements deemed unacceptable according to the Latin protocol. A number of Syriac texts were condemned and ordered burnt, including the Peshitta, the Syriac version of the Bible. [page needed] Some of the reforms, especially the elimination of caste status, reduced the Saint Thomas Christians' standing with their socially stratified Hindu neighbors. The Synod formally brought the Saint Thomas Christians into the Catholic Church; however, the actions of the Portuguese over the ensuing years fueled resentment in segments of the community, and ultimately led to open resistance to their power. Over the next several decades, tensions seethed between the Portuguese and the remaining native hierarchy, and after 1641 Archdeacon Thomas, the nephew and successor to Archdeacon George, was often at odds with the Latin prelates. In 1652, the escalating situation was further complicated by the appearance in Mylapore of a mysterious figure named Ahatallah, who claimed to have been sent by the Syriac Orthodox Church, the Church of Antioch to serve as "Patriarch of the Whole of India and of China". Ahatallah made a strong impression on the native clergy, but the Portuguese quickly decided he was an impostor, and put him on a ship bound for Europe by way of Goa. Archdeacon Thomas, desperate for a new ecclesiastical leader to free his people from the Padroado, travelled to Cochin and demanded to meet Ahatallah and examine his credentials. The Portuguese refused, stating the ship had already left for Goa. Ahatallah was never heard from in India again, inspiring rumours that the Portuguese had murdered him and inflaming anti-Portuguese sentiments even more. This was the last straw for the Saint Thomas Christians, and in 1653 Thomas and community representatives met at the Church of Our Lady in Mattancherry to take bold action. In a great ceremony before a crucifix and lighted candles, they swore a solemn oath that they would never obey Garcia or the Portuguese again, and that they accepted only the Archdeacon as their shepherd. The Malankara Church and all its successor churches regard this declaration, the Coonan Cross Oath, as the moment their church regained its independence from the catholic church, which they lost during the synod of Diamper. Shortly after, the leaders of this independent church decided their "Archdeacon" Parambil Thomas should be elevated to a "bishop". Thus Thomas was consecrated in a ceremony in which twelve priests laid hands on him, and he became the Metropolitan of Malankara. After the Coonan Cross Oath the Portuguese missionaries attempted for reconciliation with Saint Thomas Christians but were not successful. Later, Pope Alexander VII sent the Roman bishop Joseph Sebastiani at the head of a Carmelite delegation that succeeded in coercing some Saint Thomas Christians, including Palliveettil Chandy Kathanar and Kadavil Chandy Kathanar. As a reward for his submission, Palliveettil Chandy Kathanar was consecrated as the Metropolitan for the Roman Catholics who professed to obey the catholic church. [full citation needed] This led to the first permanent[clarification needed] split in the Saint Thomas Christian community. Thereafter, the faction affiliated with the Catholic Church under Bishop Alexander De Campo was designated the Pazhayakuttukar, or "Old Party", while the branch affiliated with Mar Thoma I was called the Puthankuttukar, or "New Party". These appellations have been somewhat controversial, as the real name of the church was Malankara church and the puthankuttukar used this name and also as both groups considered themselves the true heirs to the Saint Thomas tradition, and saw the other as heretical. In 1665, Gregorios Abdal Jaleel, a Bishop sent by the Syrian Orthodox Patriarch of Antioch arrived in India and the Puthenkoor faction under the leadership of Mar Thoma I welcomed him. [full citation needed][full citation needed] This visit gradually introduced the West Syriac liturgy, customs and script to the Malabar Coast. The Old Party, who continued with the Latinized East Syriac traditions and stayed faithful to the Catholic Church came to be known as the Syro-Malabar Catholic Church. The Indian East Syriac Catholic Hierarchy was restored on 21 December 1923 with Mar Augustine Kandathil as the first Metropolitan and Head of the Syro-Malabar Church. The Jacobite prelate Mar Gregorios who came to Kerala in 1751, consecrated Rev. Kurian Kattumangat as bishop Abraham Mar Koorilose in 1772 at Mattancherry church, Cochin. He was driven into exile from the states of Travancore and Cochin where the majority of St. Thomas Christians lived, to Anjoor in the state of Malabar. He spent his days in prayer and meditation in a hut. A few relatives and friends joined him there. This group was known as Thozhyoor Church later named as Malabar Independent Syrian Church, after a court verdict on 28 May 1863. In 1795, the kings of Travancore and Cochin entered into tributary alliance with the British East Indian Company to repel the attacks from Tipu Sultan. The states soon became client regimes of the Company: both were forced to disband their military. The political order of the states also began to collapse. Saint Thomas Christians were hit hard by the loss of their privileged military role, their kalari network was dissolved and many families lost their livelihood. The trading class, as well as the office bearers, also suffered the setback and many Europeans who visited the states between 1801 and 1820 noted the poor and depressed condition of Saint Thomas Christians of the Puthiyakoottukar. Some partisan fund allocation for the churches by the British officials triggered a breakdown in the relationship between Saint Thomas Christians and prominent Hindu castes, at least temporarily. In 1815, the British Resident, Colonel John Munro, founded a seminary in Kottayam, for the theological education of Jacobite Christian priests and invited the Anglican missionaries to teach there. This could be regarded as the beginning of the relationship between the CMS (Church Mission Society) and the Saint Thomas Christians of the Puthiyakoottukar. As a protest against the interference of the Anglican Church in the affairs of the Puthankoor faction of the Malankara Church, the Metropolitan, Cheppad Mar Dionysius, convened a Synod at Mavelikara on 16 January 1836. There it was declared that Malanakara Church would be subject to the Syrian traditions and Patriarch of Antioch. The declaration resulted in the separation of the CMS missionaries from the communion with the Malankara Church. However a minority from the Malankara Church, who were in favor of the reformed ideologies of the missionaries, stood along with them and joined the Anglican Church. These Saint Thomas Anglicans, were the first reformed group to emerge from the Saint Thomas Christian community and they worked along with the missionaries in their evangelical, educational and reformative activities. In 1879, the Anglican diocese of Travancore and Cochin was established, in Kottayam. On 27 September 1947, a little over a month after Indian independence, the Anglican Church in South India united with similar other reformed Churches in the region and formed the Church of South India (CSI); an autonomous Indian church within the Anglican Communion. Since then, Anglican Syrian Christians have been members of the Church of South India and also came to be known as CSI Syrian Christians. By June 1875, there were two factions in the Malankara Church ; (Bava) and Reform (Methran) Party. Mathews Mar Athanasius was the Malankara Metropolitan approved by the Governments of Travancore and of Cochin and the group with him was known as "Reform Party" since Mathews Mar Athanasius was supportive to the reformation of Jacobite church with evangelistic ideologies. The Syrian faction, under the leadership of Metropolitan Pulikkottil Joseph Mar Dionysious II, opposed the attempts to do away with age-old traditions of the church, which resulted in a stir in the community. Being invited by this faction, the Antiochene Patriarch Moran Mar Ignatius Peter III arrived in Kerala. In June 1876, at the synod of Mulanthuruthy, presided over by the Patriarch, the Syrian faction formally came under the Antiochene Patriarchate. The synod condemned Mathews Mar Athanasius for abstaining from it, but his followers stayed firm with him. His successor Thomas Mar Athanasius and the bishop's faction lost the lawsuit to the Patriarchal faction in the Royal Court of Travancore on 12 July 1889. Nonetheless, the Reform Party continued as an independent, Malankara Church and thereafter a series of suits arose on the rights over churches and associated properties. Later they chose the name Mar Thoma Syrian Church. In 1912, due to attempts by the Antiochean Patriarch to gain temporal powers over the Malankara Church (Puthenkoor faction), there was another split in the West Syriac community when a section declared itself an autocephalous church and announced the re-establishment of the ancient Catholicate of the East in India. This was not accepted by those who remained loyal to the Patriarch, and this group, popularly known as Patriarch's Party recognized the temporal power of the Patriarch over the assets of their church, while the other side, known as Metropolitan Party, accepted the supremacy of Patriarch only over the spiritual matters. The two sides filed a series of lawsuits in the civil courts and some parallel attempts to reconcile both the parties also took place. In 1958, bishops of both the parties sealed their reconciliation and signed a treaty which in turn recognized the autonomy of reunited factions, with its own synod of bishops under the presidency of the Catholicos. The verdict of the Supreme Court of India in 1959, legitimizing the autonomy of Kerala church, was also instrumental to keep this formal reconciliation between the two sides. Nonetheless, in 1975, both the parties split again with the decision of the Universal Syrian Synod, held in Damascus, to depose the Catholocos in Kerala. Today the West Syriac community in India is divided into Malankara Orthodox Syrian Church (in Oriental Orthodox Communion, autocephalous), Malankara Jacobite Syrian Orthodox Church (in Oriental Orthodox Communion, under Antioch). In 1930 a section of the Malankara Church (Puthencoor faction) under the leadership of Mar Ivanios and Mar Theophilus left the Church and came into communion with the Catholic Church. They are known as Syro-Malankara Catholic Church. In 1961, there was a split in the Malankara Mar Thoma Syrian Church which resulted in the formation of St. Thomas Evangelical Church. Since the later 20th century, neo-charismatic churches have attracted some St. Thomas Christians. These are typically churches with doctrines and practices similar to traditional Pentecostal or Charismatic churches but without a formal denominational tie. The neo-charismatic movement can be found both within established St. Thomas Christian churches, such as the Charismatic and gospel ministries of Syro-Malabar, Syro Malankara & Mar Thoma Syrian Church, and in newer independent denominations, including the New Apostolic Church, the Assemblies of God, the Indian Pentecostal Church of God (IPC), the New Life Fellowship, and the Manna Full Gospel Churches. Participation based on caste and community divisions and sympathies has been a feature of politics in the present day state of Kerala and its predecessor entities. Until the mid-20th century the primary cause of the divisions between the various communities was competition for rights and resources. Like other communities, Saint Thomas Christians have been involved in regional politics on a community basis. In 1888, Travancore became the first princely state in India to establish a Legislative Council, which was reformed as the Sree Moolam Popular Assembly in 1904. A few Saint Thomas Christian leaders were elected to the Legislative Council but there was resentment that their share of the available seats was proportionately less than that of other prominent castes. This resentment led to a series of campaigns for equal representation both in the legislature and in government positions. Newspapers such as Malayala Manorama and Nasrani Deepika disseminated the grievances. In 1918, Saint Thomas Christians formed the League for Equal Civic Rights, which sought the opening of all branches of government service to Christians, Muslims and avarna Hindus, as well as an end to the practice of untouchability. Their demands were partially met in 1922 when the Revenue Department was separated from the Devaswom, a semi-government organization that managed the Hindu temples, thus removing the restriction on non-Hindus and avarnas in the executive service. In the 1920s, Saint Thomas Christian leaders such as George Joseph were advised by Mahatma Gandhi to detach from Vaikom Satyagraha, an agitation for the temple entry rights of avarna Hindus, as he considered the issue to be one of concern to Hindus alone. With the institution in 1932 of a bicameral legislature in Travancore, four Saint Thomas Christians found a place in among the 24 seats of the lower house, but not comparable with other forward castes. The 1931 census recorded over 31 per cent of the population as being Christian, compared to around 4 per cent in 1820. Some restrictions were imposed on Saint Thomas Christian parishes to start new schools and later on the Diwan attempted to take over the schools owned by the community. In 1933, some prominent Saint Thomas Christians, including T. M. Varghese, worked to organize other communities on a common platform called the Joint Political Congress, which then decided to abstain from participation in the assembly elections, an action that has become known as the Abstention Movement. There followed a period of fierce confrontation between the Diwan and Saint Thomas Christians—many leaders were arrested, prominent news papers were banned and large banks owned by the community members were liquidated. But the agitations continued and to resolve the issue, government appointed a franchise and delimitation commissioner to solve the problem of representation in the legislator with special reference to backward communities. Though there was no definite assurance to Saint Thomas Christians, Joint Political Congress decided to withdraw the agitation. According to the recommendations of commissioner, franchise power was extended beyond the caste bars. In 1937, general elections were held and Joint Political Congress played a significant role to attain much better representation for allied communities. T.M. Varghese was elected as the Deputy President of the Assembly where Iyer[who?] was the ex officio President. On the collapse of Joint Political Congress due to internal conflicts, Saint Thomas Christian leaders allied with Nairs in a common platform- Travancore State Congress where they fought together for responsible government and also to oust Iyer. Many Saint Thomas Christian bishops like Metropolitans Abraham Mar Thoma, Yuhanon Marthoma, Mar James Kalaserry supported the nationalistic movements in 1930s and 1940s. Abraham Marthoma mobilised Syrian Christians against divans move not to unite with free India. Following intense agitations by the Travancore State Congress, the Maharaja of Travancore announced plans to establish a responsible Government. As per the announcement on 4 September 1947, the new Assembly called the Representative Body was formed to function as a Constituent Assembly. The Assembly held its first sitting on 20 March 1948 with President A. J. John, Anaparambil, a Saint Thomas Christian leader in the chair. In the three-member Cabinet of Travancore formed after the first general elections in 1948, Varghese was a Cabinet Minister. However the first Saint Thomas Christian to become a minister in the central government of India was Padma Vibhushan John Mathai, who served as India's first Railway Minister and subsequently as India's Finance Minister, taking office shortly after the presentation of India's first Budget, in 1948. On 1 November 1956, the state of Kerala was formed and the Communist Party formed the first government of the state in 1957 on winning the assembly elections. [incomplete short citation] Though the government initiated the legislation process for reforming the land and the education sectors, these were considered as infringements over the rights by the school managements and landowners, who were predominantly Saint Thomas Christians and Nairs. The disagreements of the Saint Thomas Christians further widened and they allied with Nair Service Society to mobilize against the government, which culminated in a violent struggle, called the Liberation Struggle, in 1958. The Communist government was dismissed on 31 July 1959 and the President's rule was imposed in the state under Article 356 of the Constitution of India. St. Thomas Christians are a distinct community, both in terms of culture and religion. Though their liturgy and theology remained that of East-Syrian Christians of Persia, their life-style customs and traditions were basically Indian. It is oft-quoted: "Nazranis are Indian in culture, Christian in faith and Syrian in liturgy". Jewish influence has been observed in Malabar Nasrani liturgy and traditions. The community maintained some of the original Jewish rituals, such as covering their heads while in worship. Their ritual services were and still are called the Qurbana, which is derived from the Aramaic term Qurbana (ܩܘܪܒܢܐ), meaning "sacrifice". Nasrani Qurbana used to be held in Syriac. Saint Thomas Christians typically followed the social customs of their Hindu neighbors, and the vestiges of Hindu symbolism could be seen in their devotional practices. Social sins like Untouchability entered their practices and the Synod of Diamper abolished it. The rituals related to birth, marriage, pregnancy, death etc. were also largely adapted from Hindu religious practices. Now also, tying Thaali, a Hindu symbol of marriage is the most important rite in the Christian marriages too. They used to learn temple arts like Kathakali, Kooth and Thullal and their own art forms like Margam Kali and Parichamuttukali have some resemblance to Yathra kali Pattu of Brahmins in Kerala. 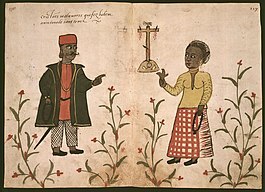 In 1519, a Portuguese traveler Duarte Barbosa on his visit to Malabar commented on the practice of Saint Thomas Christian priests using Kudumi similar to that of Hindus, in his manuscript "Book of Duarte Barbosa". In the social stratification of medieval Malabar, Saint Thomas Christians succeeded in relating their social status with that of upper-caste Hindus on account of their numerical strength and influence and observance of many Brahmin and upper caste customs. In the 13th and 14th centuries, many Saint Thomas Christians were involved in the pepper trade for the local rulers and many were appointed as port revenue officers. The local rulers rewarded them with grants of land and many other privileges. With growing numerical strength, a large number of Saint Thomas Christians settled in the inland pepper-growing regions. They had the right to recruit and train soldiers and Christian trainers were given with the honorary title "Panikkar" like their Nair counterparts. They were also entitled with the privilege to collect the tax, and the tax-collectors were honored with the title "Tharakan". Like Brahmins they had the right to sit before the Kings and also to ride on horse or elephant, like the royals. They were protectors of seventeen underprivileged castes and communities and hence they were called Lords of Seventeen Castes. They did not allow the lower-castes to join their community for fear that it could imperil their upper-caste status. Between the 9th and 15th centuries, Saint Thomas Christians had a kingdom of their own, Villarvattom, but this regal period ended when the community fell under the power of the Rajas of Cochin and Travancore. They owned a large number of Kalaripayattu training centers and the Rajas of Travancore and Cochin, including the renowned Marthanda Varma, recruited trained Christian warriors to defend their kingdom. The upper-caste Hindus and Saint Thomas Christians took part in one another's festival celebrations and in some places in Kerala, the Hindu Temples and Saint Thomas Christian Churches were built on adjoining sites by the Hindu Kings. Until the 19th century, Saint Thomas Christians had the right of access to Hindu temples and some leading Saint Thomas Christians held the status of sponsors at Hindu shrines and temple festivals. But in the 19th century, Saint Thomas Christian integration with the Hindu caste system was disrupted: their clean-caste status was questioned in some localities and they were denied access to many Hindu temples. They tried to retaliate by denouncing Hindu festivals as heathen idolatry. Clashes between upper-caste Hindus and Saint Thomas Christians occurred from the late 1880s, especially when festivals coincided. Internecine violence among various Saint Thomas Christian denominations aggravated their problems. The earliest documentary evidence is Tharisapally Copper Plate, which refers to the construction of the church of Tharisapally in Quilon between 823 and 849 AD. Antonio Gouvea, Portuguese envoy to Malabar, mentions in his 16th-century work Jornada that almost all the churches of Saint Thomas Christians followed the models of Hindu temples of that period, but were distinguished by the huge granite cross in the front yard of the church. Despite the external similarity with temples, the structuring of the interior space of the church always followed the East Syriac architectural theology. Thus the contemporary style is formed as an amalgamation of Indian architecture and Assyrian liturgical concepts. The church is arranged east-to-west, with the interior structured into three levels: the madbaha (sanctuary), the qestroma (choir) and the haykla (nave). The madbaha, arranged in the topmost platform at the eastern side of the building, represents Heaven. The primary altar is attached to the eastern wall. To the north of the madbaha is the diaqonikon (sacristry); to the south is the baptistery. The madbaha is protected with rails and is veiled by a red curtain most of the time; this is opened during the Holy Qurbana (Eucharist). An oil lamp within the sanctuary is kept glowing at all times to represent the presence of God. The madbaha is connected to the qestroma and haykla by a low-walled path called the sqaqona. The qestroma contains seats for the choir and lower clergy. The haykla contains an elevated platform or bema, which includes an altar, two lecterns for reading, and chairs for higher clergy. Worshipers stand before the altar, with separate seating for men and women. The main entrance is on the western side of the building; a vestibule, pillars, pilasters, and other architectural ornaments adorn the front end, and a flag mast stands in the front yard. One or two bells are installed in the back yard to signal the timing of ritual services, the death of a church member, or to inform the public of calamities. The Latinised faction of the St. Thomas Christians have accepted the Persian cross as their symbol. They call it the Nasrani Menorah or Mar Thoma Sliba. There are several interpretations for the Latinised St. Thomas Christian Symbol. The interpretation based on Christian Jewish tradition assumes that its design was based on Jewish menorah, an ancient symbol of the Hebrews, which consists of seven branched lamp stand (candelabra). Writing in 2010, Devika and Varghese noted that "[The St. Thomas Christians] are at present a substantial minority, a powerful presence in all fields of life in Kerala." Even though the Saint Thomas Christians had to compromise their social and religious privileges in the aftermath of Portuguese subjugation, they started reemerging as a powerful community from the 19th century onward. They played a pioneering role in many spheres such as Banking, Commerce, Cash crops etc. Around 2003, among Saint Thomas Christians, 17.4% of the adult population are self-employed – the highest rate statistically among all the communities in the state of Kerala. Saint Thomas Christians lead all others with respect to per capita ownership of land, with many of them owning large estates. With changing conditions, they have shifted from the agriculture of rice and coconut to plantation based agriculture and the trading of rubber, spices and cash crops. They also take a prominent role in the educational institutions of Kerala and throughout India. The educational accomplishments of the community have helped its members to attain a good proportion of the Central and State Government jobs. With their level of education and limited employment opportunities within the state of Kerala, they became the community with the highest rate of migration. Their resultant foreign remittances have also helped the socioeconomic progress of the community. According to the Kerala Migration Survey (1998) by the Center for Developmental Studies, Kerala, Saint Thomas Christians top all other communities in Kerala with respect to the Socioeconomic Development Index which is based on parameters such as the possession of land, housing & consumer durables, education and employment status. Saint Thomas Christians still retain many of their ancient traditions and rituals, both in their social and religious life. Saint Thomas Christian services have many unique characteristics compared to others. Until the 1970s the Nasrani Qurbana was sung in Syriac. Many of the tunes of the Saint Thomas Christian worship in Kerala are remnants of ancient Syriac tunes of antiquity. The Baptism is still known by the Aramaic term Mamodisa among Saint Thomas Christians and follows many of the ancient rituals of the ceremony. It is referred to in Malayalam as Njana Snanam ("Bath of Wisdom"). Saint Thomas Christians observe Holy Thursday with high reverence. This day is referred to as Pesaha, a Malayalam word derived from the Aramaic or Hebrew word for Passover—Pasha or Pesah—commemorating the Last Supper of Jesus Christ during Passover in Jerusalem. The tradition of consuming Pesaha Appam after the church service is observed by the entire community under the leadership of the head of the family. Special long services followed by the Holy Qurbana are conducted during the Pesaha eve in the churches. The community observes Lent, locally called the fifty days' fast, from Clean Monday to the day before Easter, abjuring all meat, fish and egg. They also traditionally observe the 25 days' fast which ends on the day of Christmas. Generally, footwear is removed before entering the church and women cover their heads during worship. The ritual service (liturgy) is called the Holy Qurbana, which is derived from the Hebrew Korban (קרבן), meaning "sacrifice". The Holy Qurbana is mostly conducted and prayers recited in Malayalam. However, some parts of the Holy Qurbana are sung in Syriac. During the 20th century, the 'Qurbana-kramam' i.e. the 'book containing the order of worship', was translated into English, for the benefit of worshipers who lived outside Kerala, and did not know to read or write Malayalam. Another surviving tradition is the use of muthukoda (ornamental umbrella) for church celebrations, marriages and other festivals. Traditional drums, arch decorations and ornamental umbrellas are part of the church celebrations. Their use has become popular all over Kerala. The rituals and ceremonies of Saint Thomas Christians related to house building, astrology, birth and marriage have close similarity with those of Hindus in Kerala. Death rituals express Christian canonical themes very distantly and the influence of Hindu culture is quite noticeable. Much stress is given to ideas concerning life after death and the anticipation of final judgment. Saint Thomas Christians do not marry close relatives. The rule is that the bride and groom must not be related for at least five generations. Saint Thomas Christians generally prefer arranged marriages and the prospective partners see each other in the Pennukanal (Bride Viewing) ceremony at bride's home. Saint Thomas Christian marriage customs are uniquely different from Western Christian marriage and local Hindu marriage customs. For example, engagement and marriage are usually performed together in the same service. Unlike Western Christian traditions, there is no direct ring exchange between groom and bride during engagement, rather it is offered and mediated by the Kathanar who represents Jesus Christ, symbolizing that it is God who brings the couple together into marriage. Saint Thomas Christians did not use any iconography or statues of Jesus or the saints in their churches until after the arrival of the Portuguese, prior to which time the use of such symbols was deemed idolatrous. Saint Thomas Christians widely use Nilavilakku (a lighted metal lamp) in their houses and churches. Saint Thomas Christians use terms like "Eeesho" (Jesus' name in Aramaic), "Yeshu" (Hebrew name Yeshua) to denote Jesus Christ. 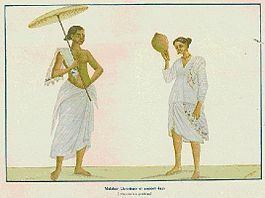 The traditional dress of a Saint Thomas Christian woman is the Chatta and Mundu, a seamless white garment, which is now limited to older female adherents. Following the general trend, the Sari and Churidar have become predominant among the younger generations. The Catholic Church had been practising pouring way of baptism rather than any form of immersion. However the Malankara Church followed child immersion baptism in Baptismal font. Kunniparampil Zachariah notes that the 20th century was period of significant transition for the Saint Thomas Christians in terms of its demographic and socioeconomic status. Around 1900, the community was concentrated in a few areas, was geographically static and "... was characterised by very high death rate, very high birth rate, very early age at marriage, and 10 to 12 children per married woman". The population had increased eight-fold during the preceding century, from a base figure of about 100,000, and comprised nearly 50 per cent children. But, the population growth of Saint Thomas Christians came down drastically after 1960s, with the lowest birth rate, highest age at marriage, highest family planning user rate, and lowest fertility rate compared to other communities in Kerala. The proportion of children has come down to less than 25%. The absolute and relative size of the community is in a diminishing trend and is approaching a Zero Population Growth regime. As of 2001[update], in Kerala, more than 85 per cent of the Saint Thomas Christian population live in the seven central districts of the state – Kollam, Pathanamthitta, Alappuzha, Kottayam, Idukki, Ernakulam and Trissur. They have also migrated to other cities in India like Ooty, Mangalore, Bangalore, Chennai, Pune, Delhi, Mumbai, Coimbatore, Hyderabad and Kolkata. Migration steeply increased in the post-independence period and major destinations were United States of America, Canada, Western Europe, Australia and the Middle East. According to a rough estimate, 20–25% of the Saint Thomas Christians live outside the state of Kerala. Despite the sectarian differences, Saint Thomas Christians share a common social status within the Caste system of Kerala and is considered as Forward Caste. In historic kingdoms of Kerala such as those of Cochin and Travancore, Saint Thomas Christians were granted caste privileges that put them at least on the same level as Savarna Hindus. Anthropologist, L.K. Ananthakrishna Iyer recorded that they were given privileges in addition to those granted to groups such as Nairs, such as the right to have enclosures in front of their houses, which was otherwise only granted to the Brahmins, and were placed "almost on par with the Sovereigns". They followed the same rules of caste and pollution as did Hindus, and sometimes they were considered to be pollution neutralisers. Decree II of Action IX of the Synod of Diamper enforced by the Portuguese Inquisition in 1599 prohibited the practice of untouchability by the Saint Thomas Christians except in practical circumstances when required by law and when it was necessary to ensure social contact with the Savarna Hindus. They tend to be endogamous, and tend not to intermarry even with other Christian groupings. Internal division of Saint Thomas Christians into Northists and Southists and also into a number of sects based on the ecclesiastical orientation makes the pattern of segmentation an exceedingly complex. Forrester suggests that the Northist-Southist division forms two groups within the Saint Thomas Christian community which are closely analogous to sub-castes. The Maramon Convention is one of the largest annual Christian gatherings in Asia. It takes place in Maramon, near Kozhencherry, during February on the vast sand-bed of the Pamba River next to the Kozhencherry Bridge. The first convention was held in March 1895 for 10 days. ^ "Eparchy of Saint Thomas the Apostle of Chicago (Syro-Malabarese)". Catholic-Hierarchy.org. David M. Cheney. Retrieved 23 January 2015. ^ "The Stcei". Indianchristianity.com. Retrieved 24 September 2017. ^ a b c The Encyclopedia of Christianity, Volume 5 by Erwin Fahlbusch. Wm. B. Eerdmans Publishing - 2008. p. 285. ISBN 978-0-8028-2417-2. ^ a b The Jews of India: A Story of Three Communities by Orpa Slapak. The Israel Museum, Jerusalem. 2003. p. 27. ISBN 965-278-179-7. ^ Wilmshurst 2000, p. 19. ^ "Ecumenical Relations". marthomanae.org/website/index.php. 9 May 2016. Retrieved 26 June 2017. ^ a b Županov, Ines G. (2005). Missionary Tropics: The Catholic Frontier in India (16th–17th centuries). University of Michigan. p. 99 and note. ISBN 0-472-11490-5. ^ Malieckal, Bindu (2005). "Muslims, Matriliny, and A Midsummer Night's Dream: European Encounters with the Mappilas of Malabar, India". The Muslim World. 95 (2): 300. ^ Mathur, P. R. G. (1977). The Mappila fisherfolk of Kerala: a study in inter-relationship between habitat, technology, economy, society, and culture. Kerala Historical Society. p. 1. ^ Vadakkekara, Benedict (2007). Origin of Christianity in India: a Historiographical Critique. Media House Delhi. p. 52. ^ Thomas Puthiakunnel, (1973) "Jewish colonies of India paved the way for St. Thomas", The Saint Thomas Christian Encyclopedia of India, ed. George Menachery, Vol. II., Trichur. ^ a b Frykenberg, Robert Eric (2008). Christianity in India: from Beginnings to the Present. Oxford University Press. p. 99. ISBN 0-19-826377-5. ^ Klijn, Albertus Frederik Johannes (2003). The Acts of Thomas: Introduction, Text, and Commentary. BRILL. p. 15. ISBN 90-04-12937-5. Retrieved 7 May 2012. ^ Church History by Eusebius. Book V Chapter 10. Pantaenus the Philosopher. ^ Frykenberg, Robert Eric (2008). Christianity in India: from Beginnings to the Present. Oxford University Press. p. 103. ISBN 0-19-826377-5. ^ a b c d e Baum, Wilhelm; Dietmar W. Winkler (2003). The Church of the East: A Concise History. Routledge. p. 52. ISBN 0-415-29770-2. Retrieved 6 February 2012. ^ Frykenberg, Robert Eric (2008). Christianity in India: from Beginnings to the Present. Oxford University Press. p. 92. ISBN 0-19-826377-5. ^ James Arampulickal (1994). The pastoral care of the Syro-Malabar Catholic migrants. Oriental Institute of Religious Studies, India Publications. p. 40. ^ Orientalia christiana periodica: Commentaril de re orientali ...: Volumes 17–18. Pontificium Institutum Orientalium Studiorum. 1951. p. 233. ^ Adrian Hastings (15 August 2000). A World History of Christianity. Wm. B. Eerdmans. p. 149. ISBN 978-0-8028-4875-8. ^ Mani, Thattunkal Zachariah (2016). ThomaaSleehaayude Kerala ChristhavaSabha Onnaam Noottaandil. T.Z.Mani. p. 14. ^ Frykenberg, Robert Eric (2008). Christianity in India: from Beginnings to the Present. Oxford University Press. pp. 101–102. ISBN 0-19-826377-5. ^ Leslie Brown, The Indian Christians of St. Thomas. ^ "Nazrani Christians and the Social Processes of Kerala, 800-1500 | Nasranis". Nasrani.net. Retrieved 6 September 2015. ^ Frykenberg, Robert Eric (2008). Christianity in India: from Beginnings to the Present. Oxford University Press. pp. 102–107, 115. ISBN 0-19-826377-5. ^ Kollaparambil, Jacob (1992). The Babylonian origin of the Southists among the St. Thomas Christians. Pontifical Oriental Institute. ISBN 8872102898. ^ Swiderski, Richard Michael (1988). "Northists and Southists: A Folklore of Kerala Christians". Asian Folklore Studies. Nanzan University. 47 (1): 76–80, 80–83. doi:10.2307/1178253. JSTOR 1178253. ^ Werner Sundermann; Almut Hintze; François de Blois (2009). Exegisti Monumenta: Festschrift in Honour of Nicholas Sims-Williams. Otto Harrassowitz Verlag. p. 38. ISBN 978-3-447-05937-4. Retrieved 11 August 2012. ^ Baum, Wilhelm; Dietmar W. Winkler (2003). The Church of the East: A Concise History. Routledge. p. 53. ISBN 0-415-29770-2. Retrieved 5 April 2010. ^ a b Frykenberg, Eric (2008). Christianity in India: from Beginnings to the Present, p. 112. Oxford University Press. ISBN 0-19-826377-5. ^ Frykenberg, Eric (2008). Christianity in India: from Beginnings to the Present, p. 105 & 110. Oxford University Press. ISBN 0-19-826377-5. ^ # Silverberg, Robert (1996). The Realm of Prester John, pp. 29–34. Ohio University Press. ISBN 1-84212-409-9. ^ Fiey, J. M. (1993). Pour un Oriens Christianus novus; répertoire des diocèses Syriaques orientaux et occidentaux, p. 96. Beirut: Orient-Institut. ^ Wilmshurst, D. J. (2000). The Ecclesiastical Organisation of the Church of the East, 1318–1913, p. 343 and 391. Louvain. ^ a b Baum, Wilhelm; Dietmar W. Winkler (2003). The Church of the East: A Concise History. Routledge. p. 105. ISBN 0-415-29770-2. Retrieved 6 February 2012. ^ Vadakkekara, Benedict (2007). Origin of Christianity in India: a Historiographical Critique. Media House Delhi. p. 274. ^ Frykenberg, Eric (2008). Christianity in India: from Beginnings to the Present, 122–124. Oxford University Press. ISBN 0-19-826377-5. ^ Frykenberg, Eric (2008). Christianity in India: from Beginnings to the Present, 125–127. Oxford University Press. ISBN 0-19-826377-5. ^ Frykenberg, Eric (2008). Christianity in India: from Beginnings to the Present, pp. 127–128. Oxford University Press. ISBN 0-19-826377-5. ^ Frykenberg, Eric (2008). Christianity in India: from Beginnings to the Present, pp. 130–134. Oxford University Press. ISBN 0-19-826377-5. ^ Neill, Stephen (2004). A History of Christianity in India: The Beginnings to AD 1707. Cambridge University Press. pp. 208–210. ISBN 0-521-54885-3. Retrieved 27 January 2012. ^ Neill, Stephen (2004). A History of Christianity in India: The Beginnings to AD 1707. Cambridge University Press. p. 214. ISBN 0-521-54885-3. Retrieved 27 January 2012. ^ a b Prasad, Rajendra (2009). A Historical-Developmental Study of Classical Indian Philosophy of Morals. History of Science, Philosophy, and Culture in Indian Civilization. Volume XII, part 2. Delhi, India: Concept Publishing Company. p. 484. ISBN 81-8069-595-6. Retrieved 1 February 2011. ^ Vadakkekara, Benedict (2007). Origin of Christianity in India: a Historiographical Critique. Media House Delhi. p. 78. ^ "Tracing the heritage of Syrian Christians." The Hindu. February 21, 2011. ^ Frykenberg, Eric (2008). Christianity in India: from Beginnings to the Present, p. 136. Oxford University Press. ISBN 0-19-826377-5. ^ a b Frykenberg, Eric (2008). Christianity in India: from Beginnings to the Present, p. 367. Oxford University Press. ISBN 978-0-19-154419-4. ^ a b Neill, Stephen (2004). A History of Christianity in India: The Beginnings to AD 1707. Cambridge University Press. pp. 316–317. ISBN 0-521-54885-3. Retrieved 27 April 2012. ^ a b c Neill, Stephen (2004). A History of Christianity in India: The Beginnings to AD 1707. Cambridge University Press. p. 319. ISBN 0-521-54885-3. Retrieved 27 April 2012. ^ Neill, Stephen (2004). A History of Christianity in India: The Beginnings to AD 1707. Cambridge University Press. pp. 320–321. ISBN 0-521-54885-3. Retrieved 27 April 2012. ^ "Christians of Saint Thomas (Christian groups, India) – Encyclopedia Britannica". Britannica.com. Retrieved 18 November 2013. ^ Vadakkekara, Benedict (2007). Origin of Christianity in India: a Historiographical Critique. Media House Delhi. pp. 84, 86. ^ Vadakkekara, Benedict (2007). Origin of Christianity in India: a Historiographical Critique. Media House Delhi. p. 84 and note. ^ Catholic Encyclopedia- "St. Thomas Christians" The Carmelite Period, Dr. Thekkedath, History of Christianity in India"
^ Dr. Thekkedath, History of Christianity in India"
^ Vadakkekara, Benedict (2007). Origin of Christianity in India: a Historiographical Critique. Media House Delhi. pp. 88–89. ^ Fr. George Thalian: "` The Great Archbishop Mar Augustine Kandathil, D. D.: the Outline of a Vocation '". , Mar Louis Memorial Press, 1961. (Postscript) (PDF). ^ Puthezhathu Ramon Menon, Sakthan Thampuran, (Malayalam) Kozhikode, Mathrubhumi, 1989 (3rd ed.) p.286. ^ N. M. Mathew, History of the Marthoma Church (Malayalam), Volume 1.(2006). Page 205-207. ^ Kochumon M.P. Saintly bishops of Kattumangat (Malayalam) p. 42-44. ^ John Fenwick. The Forgotten Bishops, Georgias Press, NJ, USA. 2009. p.200-246. ^ Stephen Neill (2 May 2002). A History of Christianity in India: 1707–1858. Cambridge University Press. p. 241. ISBN 978-0-521-89332-9. Retrieved 31 August 2012. ^ Cherian, Dr. C.V., Orthodox Christianity in India. Academic Publishers, College Road, Kottayam. 2003.p. 254-262. ^ "History – CSI Madhya Kerala Diocese". ^ "Missionaries led State to renaissance: Pinarayi". The Hindu. 13 November 2016. ISSN 0971-751X. ^ "Kerala to celebrate CMS mission". Church Mission Society. 9 November 2016. ^ "A History of the Church of England in India, by Eyre Chatterton (1924)". anglicanhistory.org. ^ "CSI Madhya Kerala – CSI Madhya Kerala Diocese". ^ Dr.Juhanon Mar Thoma Metropolitan. Christianity in India and a Brief History of the Marthoma Syrian Church. Pub: K.M. Cherian. 1993. ^ "Anglican Communion official website – The Church of South India (United)". Retrieved 21 June 2008. ^ M.P. Varkey, Pulikkottil Joseph Mar Dionysious II, Metropolitan of Jacobite faction of Malankara Church. (Malayalam), Malayala Manorama. 1901. ^ Cheriyan, Dr. C.V., Orthodox Christianity in India. Academic Publishers, College Road, Kottayam. 2003. p. 294. ^ N.M. Mathew, History of the Marthoma Church (Malayalam), Volume II.(2007). Page 125. ^ Vadakkekara, Benedict (2007). Origin of Christianity in India: a Historiographical Critique. Media House Delhi. pp. 94–96. ^ Cherian, Dr. C.V., Orthodox Christianity in India. Academic Publishers, College Road, Kottayam. 2003.p. 354. ^ Rev. Thomas, P.T. & Rev. P.C. Zachariah. It Happened in The Mar Thoma Church. 1961. ^ Thomas, K.T. & Rev. T.N. Koshy. Faith On Trial. Ernakulam. 1965. ^ Burgess M., Stanley (January 2001). "PENTECOSTALISM IN INDIA: AN OVERVIEW" (PDF). Asian Journal of Pentecostal Studies. 4 (1): 95–96. Retrieved 3 March 2014. ^ a b c d Devika, J.; Varghese, V. J. (March 2010). To Survive or to flourish? Minority rights and Syrian Christian assertions in 20th century Travancore (PDF). Trivandrum: Centre for Development Studies. Archived from the original (PDF) on 26 May 2012. Retrieved 27 April 2012. ^ Jeffrey, Robin (March 1976). "Temple Entry Movement in Travancore". Social Scientist. 4 (8): 11–12. Archived from the original on 3 June 2012. Retrieved 15 May 2012. ^ Devika, J.; Varghese, V. J. (March 2010). To Survive or to flourish? Minority rights and Syrian Christian assertions in 20th century Travancore (PDF). Trivandrum: Centre for Development Studies. pp. 19–20. Archived from the original (PDF) on 26 May 2012. Retrieved 27 April 2012. ^ "www.keralaassembly.org". www.keralaassembly.org. Retrieved 16 June 2012. ^ Reflections on Finance Education and Society. Motilal Banarsidass Publication. p. 114. ISBN 9788120830752. Retrieved 22 July 2009. ^ Thomas Johnson Nossiter (1982). Communism in Kerala: A Study in Political Adaptation. University of California Press. pp. 155–156. ISBN 978-0-520-04667-2. Retrieved 17 August 2012. ^ Amaladass, Anand (1993) [1989 (New York: Orbis Books)]. "Dialogue between Hindus and the St. Thomas Christians". In Coward, Harold (ed.). Hindu-Christian dialogue: perspectives and encounters (Indian ed.). Delhi: Motilal Banarsidass. p. 16. ISBN 81-208-1158-5. ^ a b c Vadakkekara, Benedict (2007). Origin of Christianity in India: a Historiographical Critique. Media House Delhi. pp. 325–330. ^ Amaladass, Anand (1993) [1989 (New York: Orbis Books)]. "Dialogue between Hindus and the St. Thomas Christians". In Coward, Harold (ed.). Hindu-Christian dialogue: perspectives and encounters (Indian ed.). Delhi: Motilal Banarsidass. pp. 15–19. ISBN 81-208-1158-5. ^ Malekandathil, Pius (2010). Maritime India: Trade, Religion and Polity in the Indian Ocean. Delhi: Primus Books. pp. 48–50. ISBN 978-93-8060-701-6. Retrieved 15 May 2012. ^ Mateer, Samuel (1871). The Land of Charity: A Descriptive Account of Travancore and its People. London: J. Snow & Co. pp. 241–243. Retrieved 15 May 2012. ^ Bradshaw, Paul F. (2003). The New Westminster Dictionary of Liturgy and Worship. Westminster John Knox. p. 160. ISBN 0-664-22655-8. Retrieved 27 July 2012. ^ "NSC NETWORK: Saint Thomas Cross- A Religio Cultural Logo of Saint Thomas Christians". Nasrani.net. Retrieved 16 June 2012. ^ Devika, J.; Varghese, V. J. (March 2010). To Survive or to flourish? Minority rights and Syrian Christian assertions in 20th century Travancore (PDF). Trivandrum: Centre for Development Studies. p. 11. Archived from the original (PDF) on 26 May 2012. Retrieved 27 April 2012. ^ Palackal, Joseph J. Syriac Chant Traditions in South India. Ph.d, Ethnomusicology, City University of New York, 2005. ^ "NSC Network – Passover". Nasrani.net. Retrieved 16 June 2012. ^ Weil, S. (1982)"Symmetry between Christians and Jews in India: The Cananite Christians and Cochin Jews in Kerala. in Contributions to Indian Sociology,16. ^ "Inculturation of the East Syrian Liturgy of Marriage By the St. Thomas Christians in India". www.syromalabarchurch.in. Retrieved 12 December 2017. ^ "Eashoa Msheekhah (Aramaic), Jesus the Messiah (English) or the Christ (Greek)". V-a.com. Retrieved 6 September 2015. ^ Zachariah, Kunniparampil Curien (November 2001). The Syrian Christians of Kerala: Demographic and Socioeconomic Transition in the Twentieth Century (PDF). Thiruvananthapuram: Centre for Development Studies. p. 3. Retrieved 20 December 2012. ^ a b Forrester, Duncan (1980). Caste and Christianity. Curzon Press. pp. 98, 102. ^ "WCC general secretary to address largest Christian gathering in Asia". Retrieved 5 March 2015. Kollaparambil, Jacob (1992). The Babylonian origin of the Southists among the St. Thomas Christians. Pontifical Oriental Institute. ISBN 8872102898. Aprem, Mar. (1977) The Chaldaean Syrian Church in India. Trichur, Kerala, India: Mar Narsai, 1977. Baum, Wilhelm; Winkler, Dietmar W. (2003). The Church of the East: A Concise History. London-New York: Routledge-Curzon. Iyer, K.V. Krishna, Kerala's Relations with the Outside World, pp. 70, 71 in "The Cochin Synagogue Quatercentenary Celebrations Commemoration Volume", Kerala History Association, Cochin, 1971. Harris, Ian C., ed. (1992). Contemporary Religions: A World Guide. Harlow: Longman. Landstrom, Bjorn (1964) "The Quest for India", Doubleday English Edition, Stockholm. Mathew, N. M. St. Thomas Christians of Malabar Through Ages. CSS Tiruvalla. 2003. Menachery, Professor George. (2000) Kodungallur – The Cradle of Christianity In India, Thrissur: Marthoma Pontifical Shrine. Menachery, Professor George (Ed.). (1982) The St. Thomas Christian Encyclopaedia of India, VOL.I, Thrissur. Menachery, Professor George (Ed.). (1973) The St. Thomas Christian Encyclopaedia of India, VOL.II, Thrissur. Menachery, Professor George (Ed.). (2010) The St. Thomas Christian Encyclopaedia of India, VOL.III, Ollur, Thrissur. Menachery, Professor George (Ed.with Ponnumuthan, Aerath). (2006) Indian Christians and Nation Building, CBCI-KCBC Kochi-Alwaye. Menachery, Professor George (Ed.with Snaitang). (2011) India's Christian Heritage, Church History Assn. of India, Bangalore (DVK). Miller, J. Innes. (1969). The Spice Trade of The Roman Empire: 29 B.C. to A.D. 641. Oxford University Press. Special edition for Sandpiper Books. 1998. ISBN 0-19-814264-1. Mundadan, A. Mathias. (1984) History of Christianity in India, vol.1, Bangalore, India: Church History Association of India. Poomangalam C.A (1998) The Antiquities of the Knanaya Syrian Christians; Kottayam, Kerala. Puthur, B. (ed.) (2002): The Life and Nature of the St Thomas Christian Church in the Pre-Diamper Period (Cochi, Kerala). Susan Visvanathan (1989) "Marriage, Birth and Death-Property Rights and Domestic Relationships of the Orthodox Jacobite Syrian Christians of Kerala", Economic and Political Weekly, Vol – XXIV No. 24, 17 June 1989. Susan Visvanathan (1986) "Reconstructions of the Past among the Syrian Christians of Kerala", Contributions to Indian Sociology (Sage Publishers), July 1986; vol. 20, 2: pp. 241–260. Susan Visvanathan (2010). "The Status of Christian Women in Kerala", in 'World Christianity: Critical Concepts in Religious Studies', edited by Elizabeth Koepping, London: Routledge, 2010. Tamcke, M. (ed.) (2001) : Orientalische Christen zwischen Repression und Migration (Studien zur Orientalischen Kirchengeschichte 13; Münster: LIT). Tisserant, E. (1957) Eastern Christianity in India: A History of the Syro-Malabar Church from the Earliest Times to the Present Day. Trans. and ed. by E. R. Hambye. Westminster, MD: Newman Press. Veluthat, K. (1978). Brahmin settlements in Kerala: Historical studies. Calicut: Calicut University, Sandhya Publications. Wikimedia Commons has media related to Christianity in India.